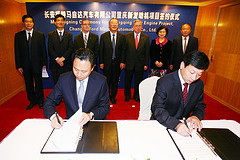 At today's signing, in foreground: Chongqing Changan Chairman Xu Liuping, left, and local government official Xiong Xue. Ford China CEO Robert Graziano is in back, third from left; Ford Motor CFO Lewis Booth is third from right. DETROIT (Bloomberg) -- Ford Motor Co.'s China venture Changan Ford Mazda Automobile Co. signed an agreement with the Chongqing municipal government to spend $500 million to build an engine plant in the western Chinese city. The planned plant will more than double Ford's existing engine capacity in China, according to an e-mailed statement from the company on Saturday. The engine factory will be Changan Ford Mazda Automobile's second and will add capacity of 400,000 units, according to the statement. The plant will mainly supply the venture's vehicle- assembly lines in Chongqing. "This new engine plant will help power our ambitious expansion plans here in the world's largest automotive market," Joe Hinrichs, Ford's president for the Asia Pacific and Africa region, said in the statement. "The growth potential in this part of the world in the next 10 years is astounding." Changan Ford Mazda Automobile is a venture among Chongqing Changan Automobile Co., Ford and Mazda Motor Corp.